The miracle is not that we do this work, but that we are happy to do it. I know some days are much happier than others, but remember you are doing a great thing. It always seems impossible until it’s done. Hang on to that today, my friends. How many times have you cried in your life? Although I’m not sure we could narrow it down to a specific number, I’m sure we would all agree that we have cried different types of tears: happy, sad, angry, grieving……the list could go on and on! Over the summer, I stumbled across the most fascinating article about tears. After a season of personal change and loss, photographer Rose-Lynn Fisher, wondered if her tears of grief would look any different from her tears of happiness, so she set out to explore them up close, using tools of science to make art and to ponder personal and aesthetic questions. 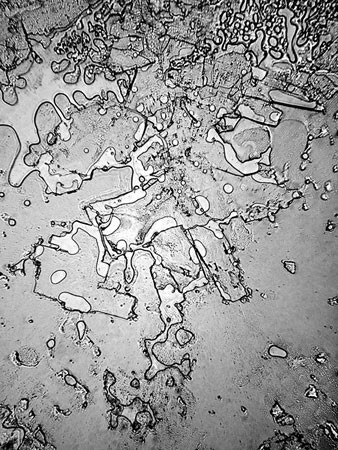 Thus The Topography of Tears project was born, which is a study of 100 tears photographed through a standard light microscope. The photography is stunning, I’ve included one image below, which are tears of ‘laughing till I’m crying’ but you really should go check it out, too! Monday’s Food for Thought: Books to Read this Year – at least before they hit the cinemas! Do you have a list of books to read for 2014? I’m the kind of person that usually reads a novel before it comes out in movie form. (Case in point, if I love the book I will often refuse to see the movie, as I have specific ideas of what the characters, etc look like)! This list came out and I wondered if any of our readers had read any of these books, or will you just be watching the movies when they come out later this year? Change is coming, at least to Johns Hopkins University, who is proposing sweeping cuts across its Ph.D. programs in order to raise grad student stipends. Those cuts include reducing graduate student enrollment by 25%. Under the new proposal, graduate students would see their stipends rise to $30,000 a year. There are a lot of arguments as to whether or not this is a good idea, as it could be emulated at other universities. The bottom line, as the article states, is that JH is taking drastic but needed measures. Given the grim statistics of prospective future jobs for PhDs, maybe it wouldn’t be a bad thing if it was emulated at other universities. What do you think? Do you think this is a good idea? Do you think it will stifle research institutions? Do you ever think about where your Christmas or holiday gifts come from, how they are made, and who they were made by? As a lot of us mull over those questions, especially this time of year, we know from reading articles like this, that there is an apparent shift in trends as consumers look to purchase from companies who are socially responsible. It can be time consuming and daunting to research every company that you’d like to purchase from, so when we stumbled across this ethical shopping guide, we thought it might assist you in your shopping. (And, it’s handy to have year round)! Do you practice ethical shopping? Is it something that you would like to begin doing?